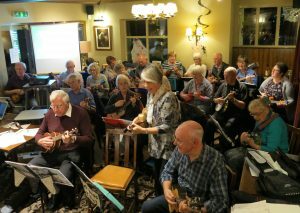 The Ukulele Band meets from 1.00 to 3.00 pm on the 2nd and 4th Tuesdays in St Mary’s Church Lounge, Church Street, Eastwood. 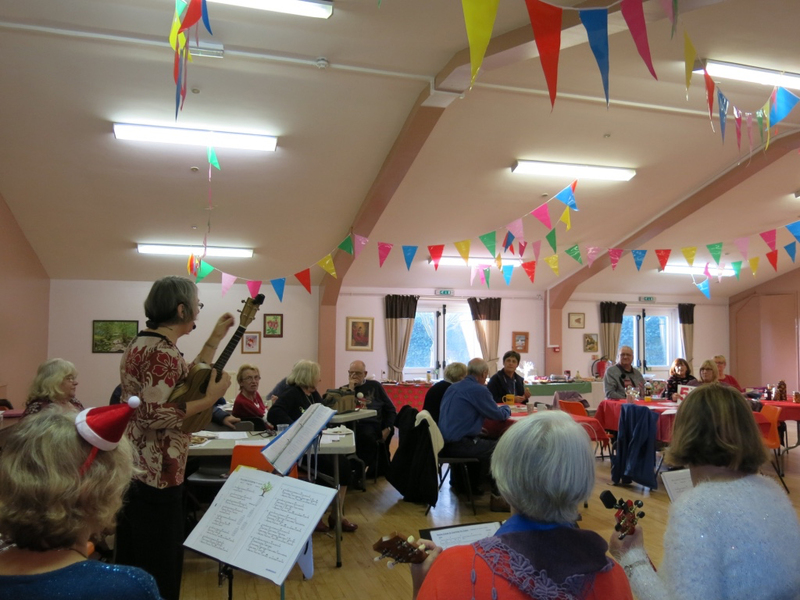 Contact person is Judith Queripel, 01773 788 047, judith.queripel@ntlworld.com. 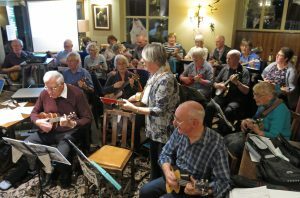 The group has been so popular that there are now 29 members. 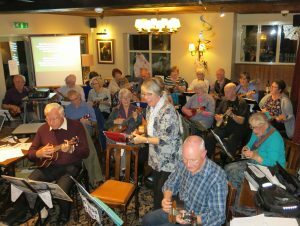 New experienced members are welcome but at the moment it is not taking on any complete beginners. However if you are interested speak to the contact Judith. 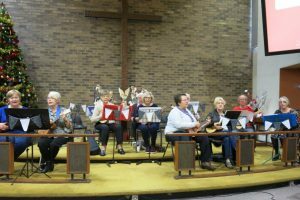 You must provide your own instrument. 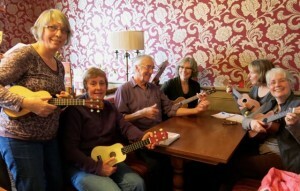 The best source is from Dave Mann Music, 160 Mansfield Road, Nottingham, where they are available from £30 and upwards. The teaching will be based on the book “Progressive Beginner Ukulele”, £9.99 also available from Dave Mann. The book includes CD, DVD and DVD-ROM. Eastwood U3leles visit to the Concert Hall, 28th November 2018. 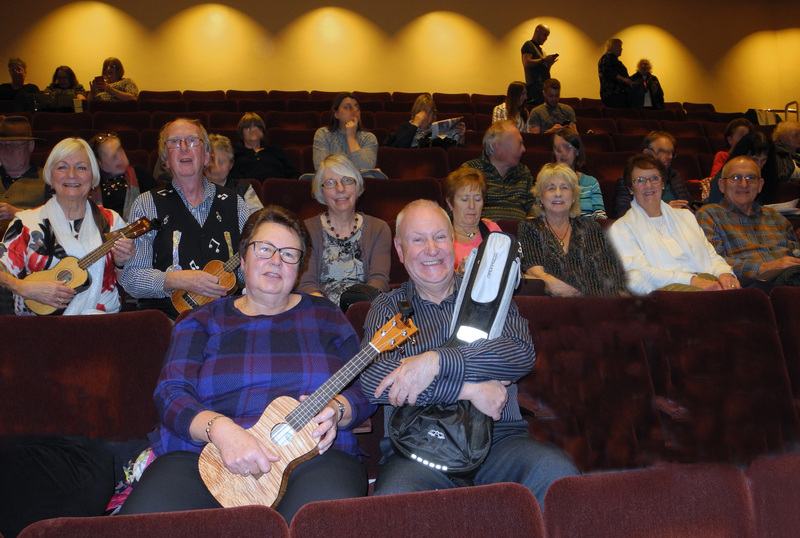 A number of members of the Ukulele Group went to the Concert Hall , Nottingham to hear The Ukulele Orchestra of Great Britain.It was a brilliant evening of entertainment with excellent musical talent and a sense of humour. There was a varied range of music played and also included the opportunity for the audience, who had brought their instruments, to join in 3 Christmas songs. 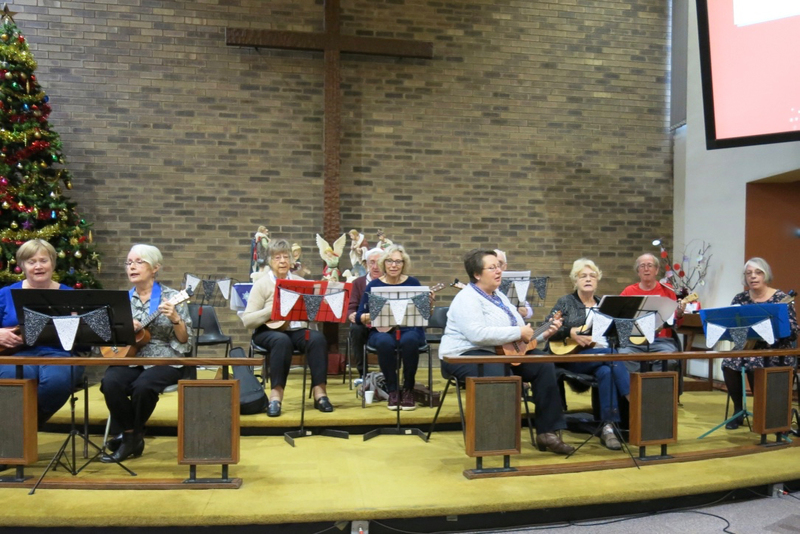 These we had managed to practice beforehand with music downloaded from their webpage. 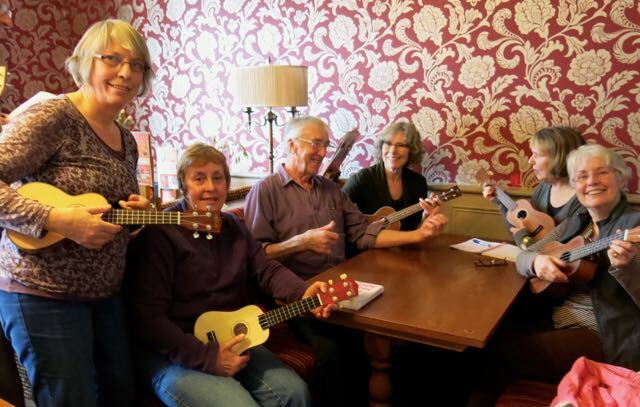 These are great musicians and the sound they produce is quite different from that of the well known George Formby from years ago. 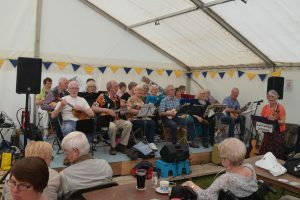 Over the May Bank Holiday weekend, the Erewash Canal Preservation Society held its 50thanniversary celebrations with a three-day festival event at the Langley Mill canal basin. 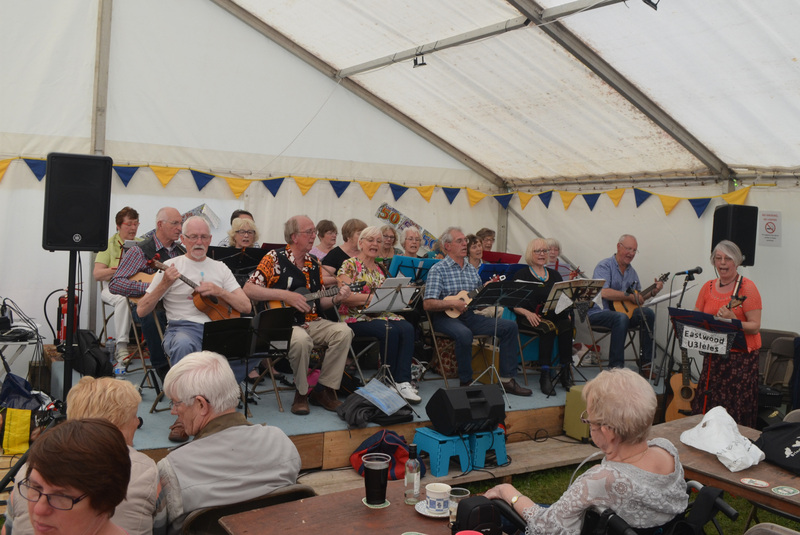 The weather was excellent and thousands visited over the weekend and enjoyed the boats, the stalls the real ales and of course the entertainment in the marquee. 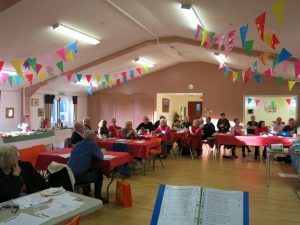 Many diverse groups contributed to this and the U3leles had the afternoon spot on Saturday after a Battle of Britain flyover by a Spitfire! 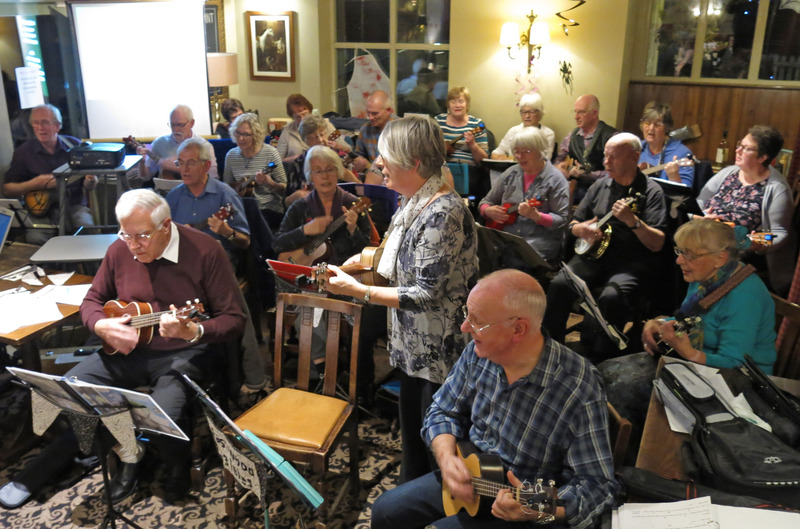 The music went well and in addition to old favourites such as Sloop John B and Wild Rover, we learnt two canal songs for the occasion and also included some traditional fiddle tunes with ukulele, guitar and concertina accompaniment. 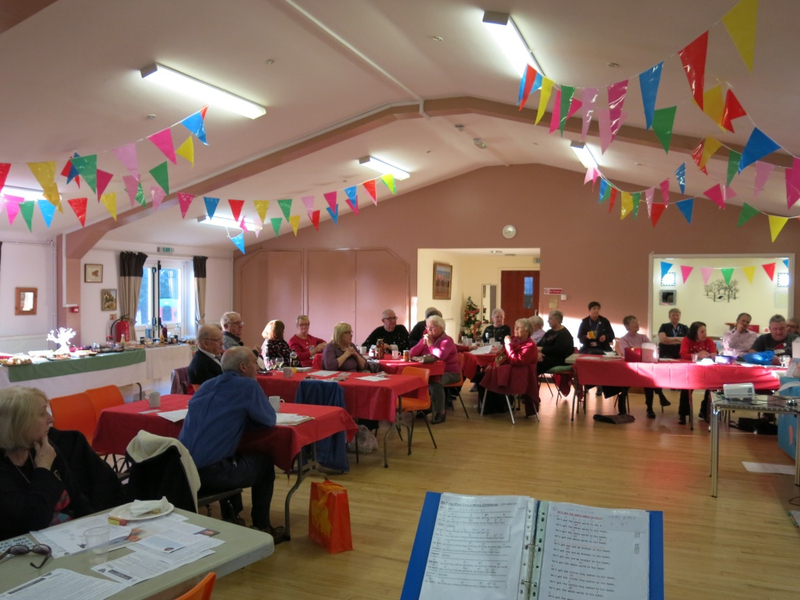 We were very well received to judge from the applause and I quote from an email sent by the event organiser. 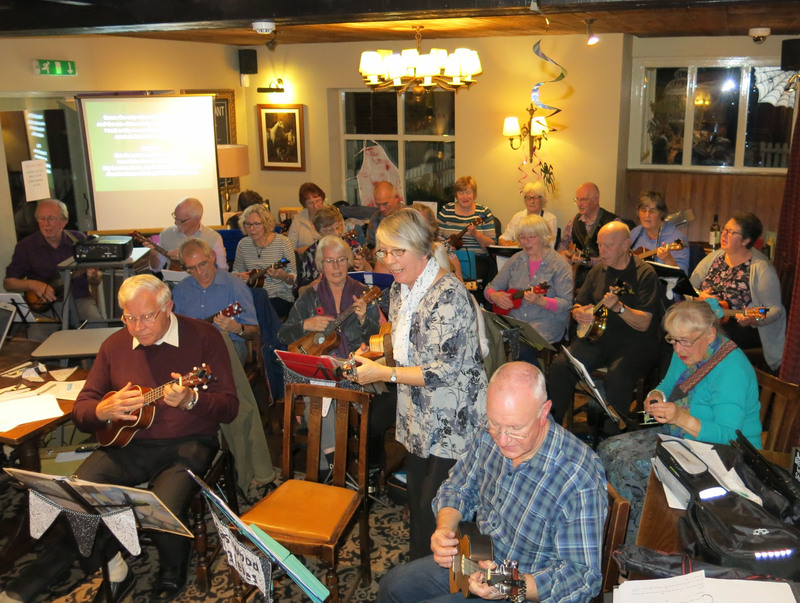 Members of the Ukulele band played two sets with a selection of their songs for Moorgreen Residents Social evening at the Horse & Groom on 30th October 2017. 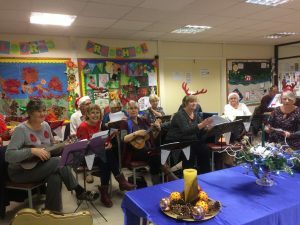 The evening was thoroughly enjoyed by all. The Ukulele group began a series of Christmas concerts at the U3A December meeting. They played a number of Christmas Carols and songs at the beginning and end of the mornings entertainment. 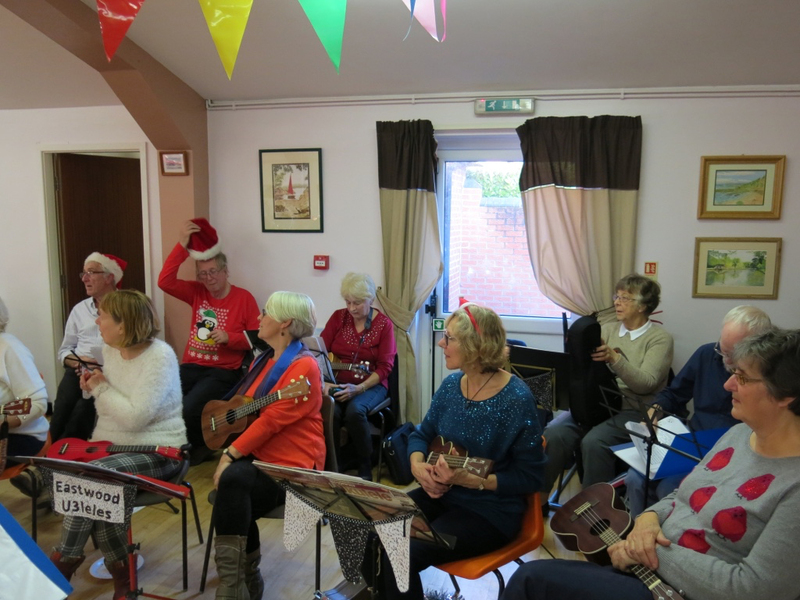 Even though we were low in numbers we were encouraged by the members joining in the singing. The Ukulele group has had a busy week before Christmas. 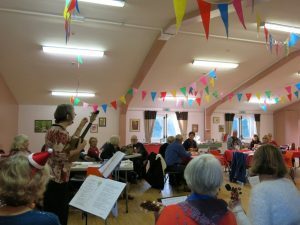 They completed their first 2 public concerts. Mid week they performed at the Eastwood Breath-easy group Christmas party. 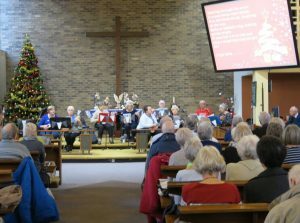 Everyone readily joined in with the singing of a range of Christmas songs and carols, ending with a very energetic rendition of the Twelve Days of Christmas. 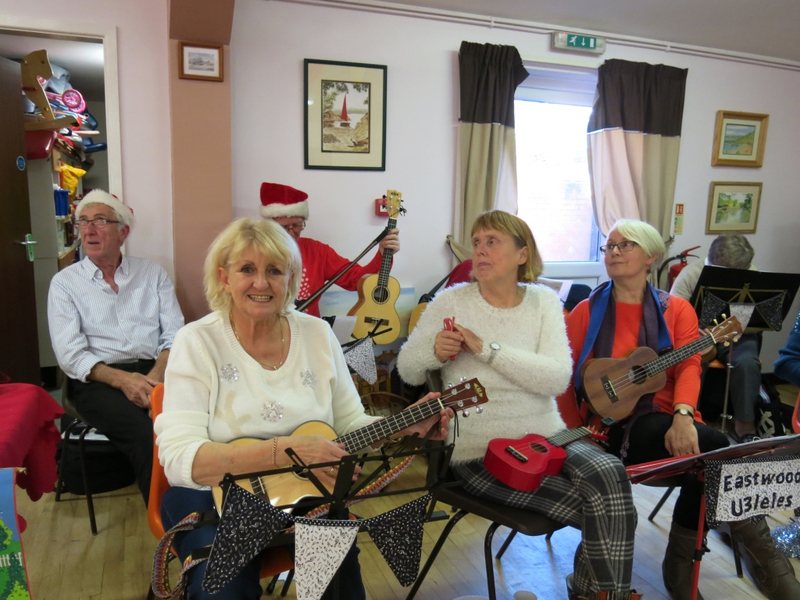 The end of the week they performed for the Underwood gardeners club at their December meeting. 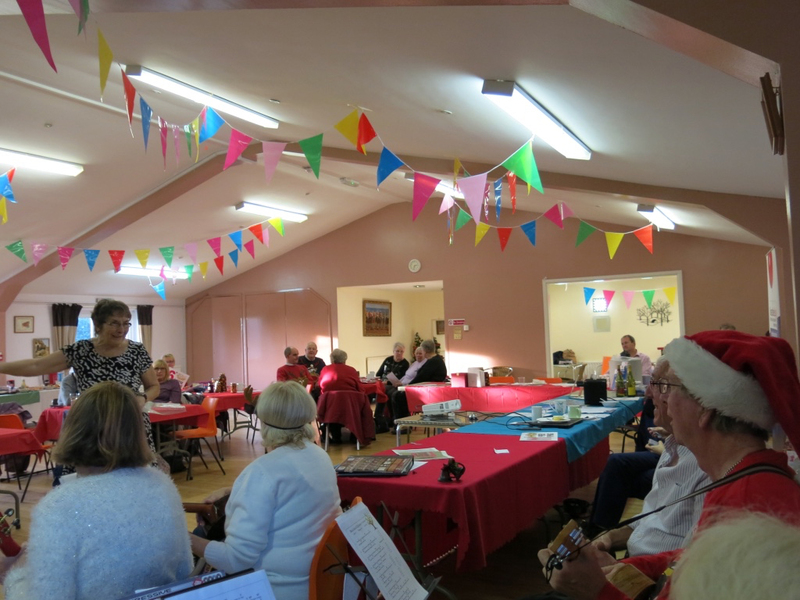 The evening began with a demonstration to show how to make a Christmas table decoration. 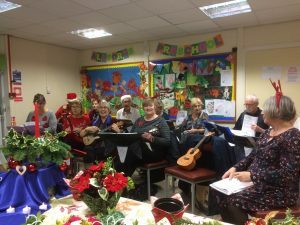 The gardening members joined in with a range of songs and carols we played afterwards.